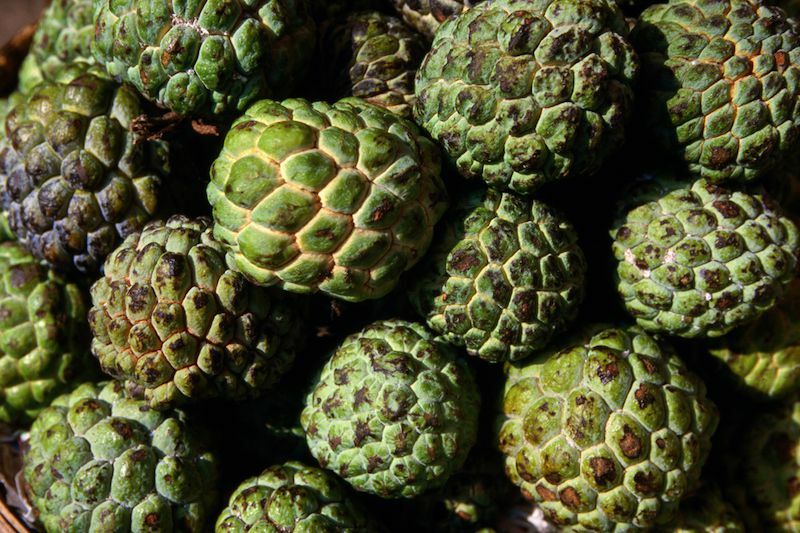 Chirimoyas, called “cherimoyas” or Custard Apples in English are a delicious tropical fruit, native to South America (Peru, Bolivia, and Ecuador). Cherimoyas grow on trees and are large (about 4 to 8 inches long and about 4 inches wide) green, heart-shaped fruit, with bumps on the outside. The inside, however, is white, juicy and fleshy, with a soft custard-like texture and large seeds that look like beans. It is creamy and tastes like a combination of banana, pineapple, and strawberry. The skin and seeds shouldn’t be eaten. Where do cherimoyas grow in Spain? Cherimoyas are a popular fruit in Spain and are grown in the southern province of Granada, near the Costa Tropical or Tropical Coast. As you drive from Granada city south to the coast, nearing Almuñecar you will pass acres and acres of these trees. So many cherimoya trees are grown in this unique micro-climate that Almuñecar celebrates the harvest with a cherimoya festival in October every year, although the fruit is available from October through the winter in Spain. When you travel to Spain, make sure to have a taste of these luscious, tasty tropical treats. How do you prepare cherimoyas? Served raw, they are wonderful for breakfast. Simply cut them in half and scoop out the flesh, picking out the seeds. If you prefer, peel and seed them and make a fruit smoothie, or put them in a salad. Where can you buy cherimoyas in the USA? In the USA, cherimoyas are considered an exotic fruit and are in high demand. They are grown in the western USA or can be purchased directly from some growers online. If you live near the coast in California, look for cherimoyas in your local Farmer’s Market. If you live in the western USA, check your gourmet grocery stores and Hispanic supermarkets.